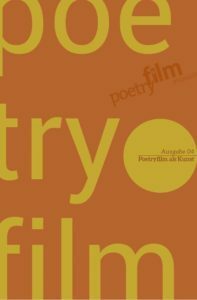 three articles of this magazine’s edition consist of the lectures that were being held at the Colloquium on »Sound and Voice-Over in Poetry Film«, which took place during this year’s backup_festival in Weimar. Austrian curator Sigrun Höllrigl pleads for a well balanced interaction between music, text and visuals, in which each element should hold back in order to leave enough space for the other. Cultural scientist Stephanie Orphal referred to Roland Barthes when she addressed the voice’s »graininess« as one of the central aspects of a poetry film. Martina Pfeiler, specialist in American studies, discusses film examples which not only undercut the intent of the visual level but initiate additional levels of significance which point beyond the text itself. The Californian performance artist Julian Mithra treats poetry as a »condensed« speech and shares her personal experience explaining how subtly the text can change through the use of the voice as an instrument. The South-African filmmaker Diek Grobler reminds us how a poet’s voice changes over the years and how this aspect can influence the concept of a poetry film. The Canadian director, moving image and title designer Justin Stephenson gives us an insight into the challenge of visualising sound poetry, referring to the sound poet bpNichols. The analysis of the voice is a well-researched topic. Yet, it was not easy to find experts who would step into the uncertain field of poetry film. All the more, we want to thank everyone who committed to share their experience and knowledge in this context. The ZEBRA awaits us with a focus on Flanders and the Netherlands, numerous awards, a retrospective on Peter Dencker and a newly curated programme. Poetryfilmkanal wishes all festival guests a splendid, inspiring time and unforgettable moments!